(Text automatically translated) "Great apartment in a newly built house, with a view of Mont Blanc in a typical, quiet and friendly neighbourhood. The decor is warm and cozy. Parking for one car." Well appointed and well located apartment with a very friendly helpful owner. This apartment is really nice and spacious, and very well equipped for those nights in. Linen service was great (the beds were even ready for us when we got there!). The owner is incredibly helpful when needed and made our late arrival very easy - as well as looking after our bags for a late transfer out of Chamonix. The location is great as it is very close to Chamonix Sud bus station (which is the starting point for buses to several of the ski areas), it's 5 minutes to the Aiguille du Midi chair and it's only a 10 minute walk to downtown. There is a very well stocked Spar close by and even an ESF office. Famille de skieurs très discrets et très respectueux des lieux loués. L'appartement était en parfait état. Je recommande ces locataires et suis prête à les accueillir une prochaine fois. Lovely apartment, very well located! My family and I loved staying in Sophie’s apartment. It is cosy and has everything you need. It is very clean and tidy. Plus it has a very good shower! The location was very good too. A quick 5 min walk to the main shopping street and also just around the corner from the Chamonix Sud bus stop. We will definitely book again! Sophie was great hosts and I would hugely recommend this place . Defenetly I would love to come back . The only issue was that the owners stayed in the apartment below and they were smokers. The smoke continually drifted through the vents up into our apartment. Not pleasant! A comfortable, convenient apartment with beautiful mountain views! My family and I stayed here for a week. Sophie made us feel right at home, provided great information and suggestions for our ski week. 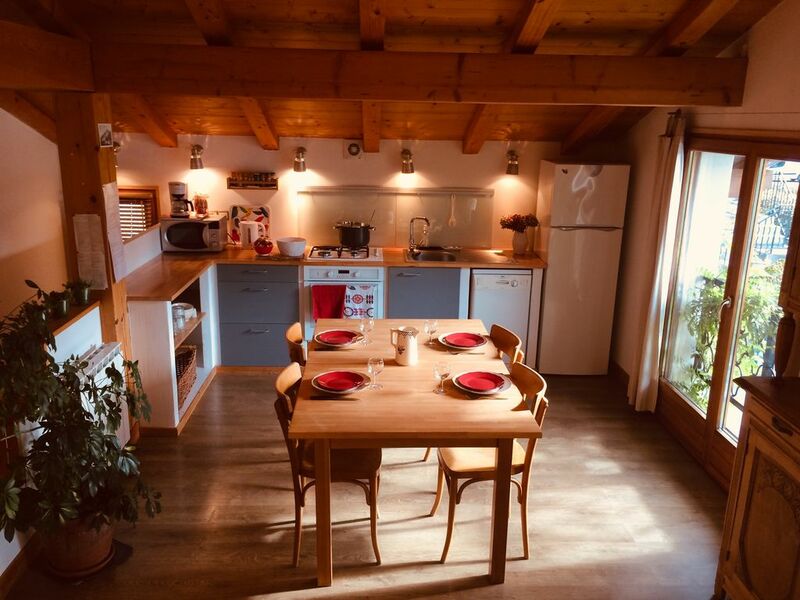 The apartment is comfortable, clean, close to the bus (for trips to all ski areas and Courmayeur) and a 5 to 10 minute walk to town. It was perfect for all of us! I already miss the beautiful views of Mt. Blanc from the kitchen and livingroom windows. We loved it and would definitely return again! Vacanciers très respectueux et discrets, de plus leur bonne humeur et leur sympathie sont très appréciables! Je les accueillerai à nouveau avec grand plaisir. Easy access by the Route Blanche. Caution demandée, arrhes à la réservation, remise des clés par le propriétaire ou son représentant.